This is the MacKenzie Family, Blackpark. 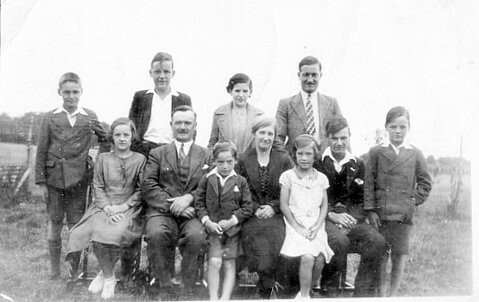 Front Row: Isabel, Dan (father), Willie, Annabel (mother), Jessie, Roddy and Kenny. They lived up the Cottage Brae where there was a railway crossing. I knew the children, and Jessie was my friend at school, so I would put this photo in the 1932-5 period. Thank you Jet, your dates are right. Hi cousin John, great to come across this picture of Granny, Grandad, my mum and all my aunties and uncles. It reminds me of all the great times I had at Blackpark when I was young. It is great to hear from you Ian. This is a great site. Lots of interesting reading about Invergordon. Isn't it nice to see all the folks in this picture.